Leadville, Colo. (Aug. 6, 2014) — The Leadville Race Series, produced by Life Time – The Healthy Way of Life Company (NYSE: LTM), will host its internationally renowned Leadville 100 Mountain Bike (MTB), presented by Herbalife24, on Saturday, August 9. Nearly 2,000 riders will take on the 100-mile course with elevations ranging from 10,152 to 12,424 feet and extreme Colorado Rockies grueling terrain in the 21st annual event. Wendy Skean hopes to be the first 70 year old women to finish in less than 12 hours. In 2005 at age 61, she finished in 11:24:36 to become the first 60 year old women to finish under 12 hours—a record she still holds. Wendy had a cycling accident in May and although she fractured her knee, she began rehab in June and will be on the start line as the oldest female participant. Christopher Self isa US Army Special Forces Sergeant Major who was severely wounded in Iraq in 2005. While his injuries resulted in the amputation of his right leg below the knee, Chris returned to active duty and completed two additional combat tours in Iraq before retiring from the US Army Special Forces in March 2013. This is his first attempt in the Leadville 100 MTB. Sonam grew up in the Kingdom of Bhutan on a rice farm in Paro Valley and is a first-time participant in the Leadville 100 MTB. He was unable to go to school past 6th grade in his country as his family needed him for labor. After joining the army, he was quickly tapped in to be a royal guard for the King because of his athleticism. He began riding four years ago when taking tourists on bike tours in the Himalayan and has since won two titles in Bhutan. His dream is to use his experience as a cyclist to promote health and a love of sports among Bhutanese children. Roger Mankus is racing for his 2,000 mile buckle. If achieved, Roger will have completed the Leadville Trail 100 MTB 20 times and participated in all but one race. In addition to Roger, 20 other Leadville competitors are going for their 1,000 mile buckle to become 10-time finishers. Adam Stepanovic is attempting to be the youngest 1,000 mile buckle holder at age 30 if he finishes under 12 hours. Adam made a pact to earn his 1,000 buckle with his father, who raced the 100 MTB for many years and recently passed away. While earning the buckle will be a significant accomplishment, Adam’s real goal is to fulfill his promise to his dad. 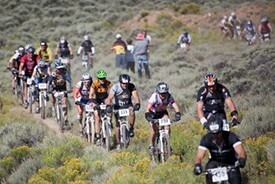 The entire pool of competitors will start the Leadville 100 MTB at 6:30 a.m. on Saturday, August 9. For more information and complete results visit www.leadvilleraceseries.com. For photos and more visit the Leadville Race Series Facebook page. To learn more about Life Time Athletic Events visit EventsByLifetime.com. About the Leadville Race Series consists of seven running events and four mountain biking events, in addition to six events in the Leadville Qualifying Series. The Race Series stretches across three months, and hosts thousands of racers on foot and on mountain bike in some of the world’s most iconic events. Every year, endurance athletes worldwide make the pilgrimage to Leadville, Colo., with the single goal of competing in “The Race Across the Sky.” Visit www.leadvilleraceseries.com for more information. Herbalife Ltd. (NYSE:HLF) is a global nutrition company that sells weight-management, nutrition and personal care products intended to support a healthy lifestyle. Herbalife products are sold in more than 90 countries to and through a network of independent Members. The company supports the Herbalife Family Foundation and its Casa Herbalife program to help bring good nutrition to children. Herbalife’s website contains a significant amount of financial and other information about the company at http://ir.Herbalife.com. The company encourages investors to visit its website from time to time, as information is updated and new information is posted. As The Healthy Way of Life Company, Life Time Fitness (NYSE:LTM) helps organizations, communities and individuals achieve their total health objectives, athletic aspirations and fitness goals by engaging in their areas of interest — or discovering new passions — both inside and outside of Life Time’s distinctive and large sports, professional fitness, family recreation and spa destinations, most of which operate 24 hours a day, seven days a week. The Company’s Healthy Way of Life approach enables members to achieve this by providing the best programs, people and places of uncompromising quality and value. As of August 6, 2014, the Company operated 112 centers under the LIFE TIME FITNESS® and LIFE TIME ATHLETIC® brands in the United States and Canada. Additional information about Life Time centers, programs and services is available at lifetimefitness.com.